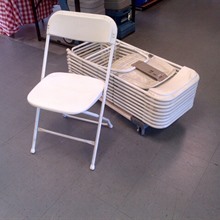 Used White Folding Chair for sale. MINIMUM QUANTITY 100. Specifications: Poly seat and backrest, Steel frame. 17.5" width, 6.75-lbs each. Good condition, some chairs need to be cleaned: $ 5.00 each. Items are sold used "as-is" without written or expressed warranty. Sold in minimum quantity of 100-chairs. $ 4.50 each in multiples of 250 chairs. Deluxe Sno-Konette #1002-00-000 has a stainless steel dome and motor cover and a heavy duty aluminum welded cabinet to protect from wear and tear. 2 blade shaver head, as well as an included drain pan and cone dispenser. 22" wide x 16" deep x 26" tall. 66-lbs. 120-volt.